I will do whatever it takes to convince you to make this for dinner tonight. You guys. 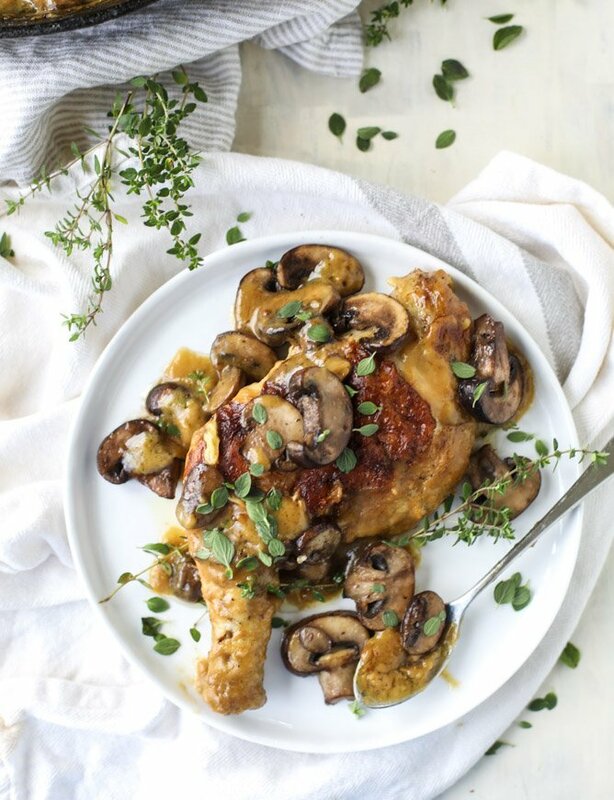 This is what I am calling our MOST favorite chicken recipe of 2017 – the absolute BEST chicken recipe that everyone in this house can’t get enough of. 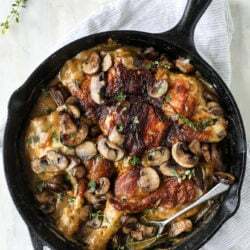 This skillet chicken and mushrooms is unreeeeeal. The gravy? You will want to drink it. The crispy chicken skin? You might fight over it. The flavor here is so incredible that I’m actually mad that I’m not making this for our dinner tonight. So I know this may not be the prettiest looking dinner… in fact it might be one of the ugliest things I’ve ever photographed. BUT. The flavor is so, so good. This is a take on Craig Claiborne’s smothered chicken from the New York Times. If I could tell you just HOW many times I have made this chicken this year? I mean, I can’t even count. Probably 20? Maybe more. It’s technically a recipe for chicken under a brick and for my “brick,” I use a plate with two ten-pound dumbbells on top. Ha! So you don’t really need an actual BRICK, you just need something super heavy that can evenly weigh the chicken down. And you’re going to cut the backbone out of the chicken. Don’t freak out! It’s so easy once you do it. Yessss. I know it looks semi unappealing. And yessss. Sometimes the most unappealing things are the best. By far, the most delish part about this chicken, well, besides the gravy annnnd besides the actual chicken, is how crispy the chicken skin gets. I was making this recipe a TON before our kitchen remodel then had to take a brief hiatus when that happened. But it was one of the first meals I made once our kitchen was put back together. And now, I make it almost weekly. I don’t tend to make it a ton in the summer months because it does warm up my kitchen quite a bit since I have a gas stove. And the whole gravy thing is more comfort food to me, not a hey-let’s-sit-on-the-deck-with-white-wine-and-caprese-salads sort of thing. You know? And even though it’s been horribly hot here (I have unapologetically fully transitioned to fall soooooo I’m just OVER it), I’ve still be making this recipe constantly since late August because it’s just so dang good. Like SO good. I’ve wanted to tell you about it. Wanted to blog about the recipe. But it looks like this and… and… I just decided to do it. 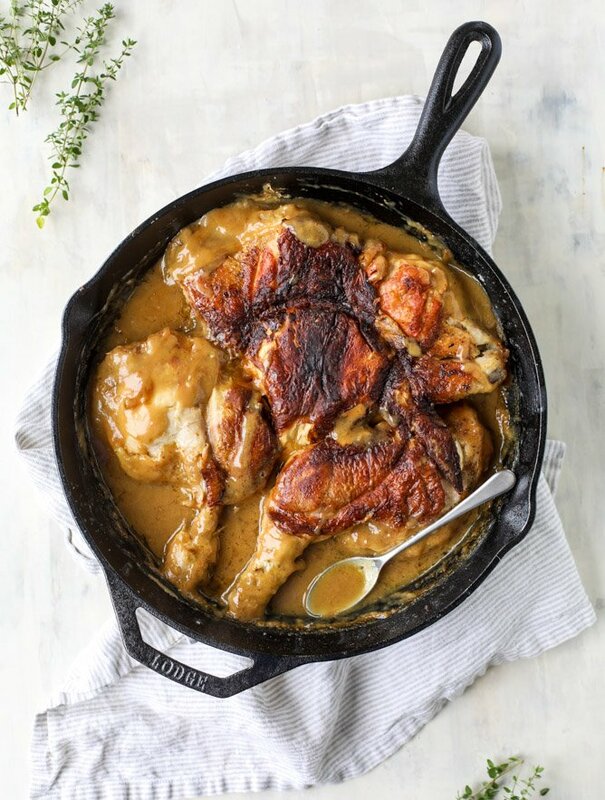 The chicken cooks in a cast iron skillet and then you use the drippings to make a gravy, which it continues to cook in. Oh my gosh. 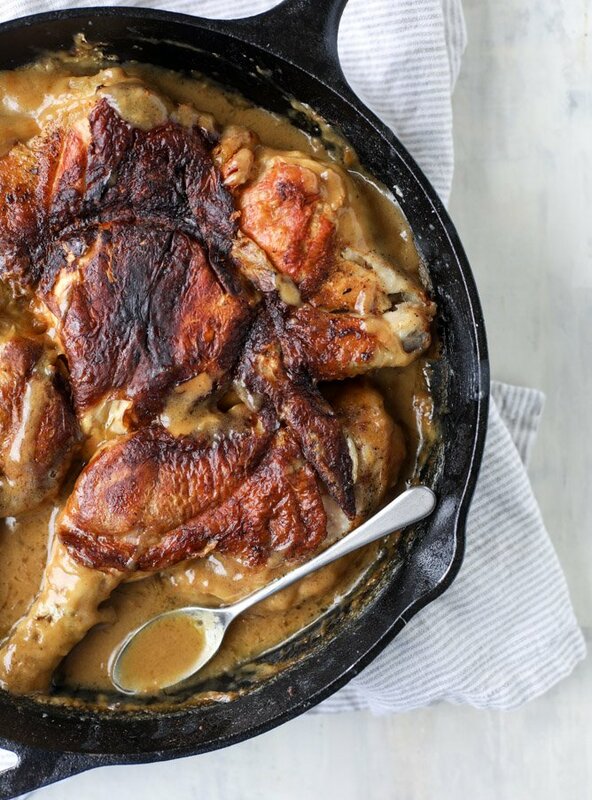 I am not a huuuuge chicken person, especially when I am pregnant (like I want nothing to do with the stuff), but I could eat a plate of this chicken with some gravy drizzled over top and call it a day. Nothing else needed. No sides. Nada. Absolutely delicious and so satisfying. HOWEVER. 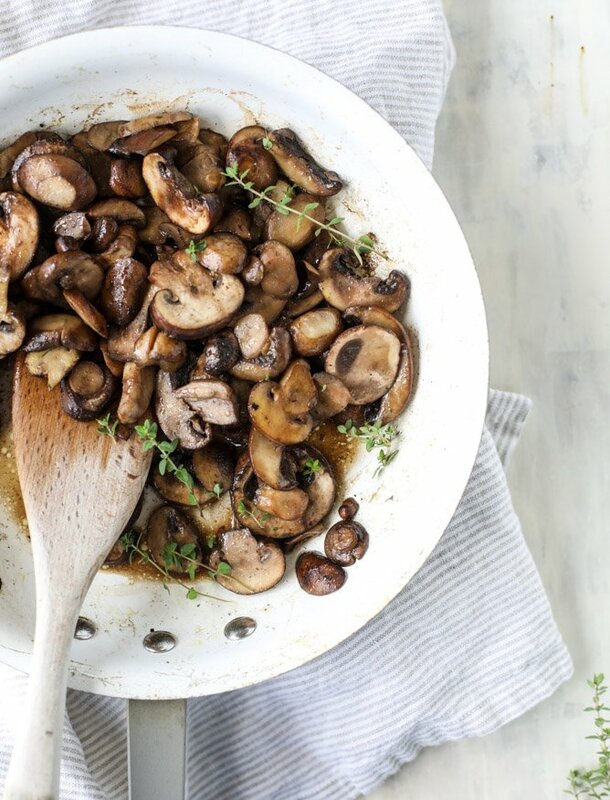 One of the things I really love to make with it are these thyme-buttered mushrooms. They get so soft and juicy and make for the most perfect topping or side dish or just accompaniment to the chicken. So flavorful and wonderful. 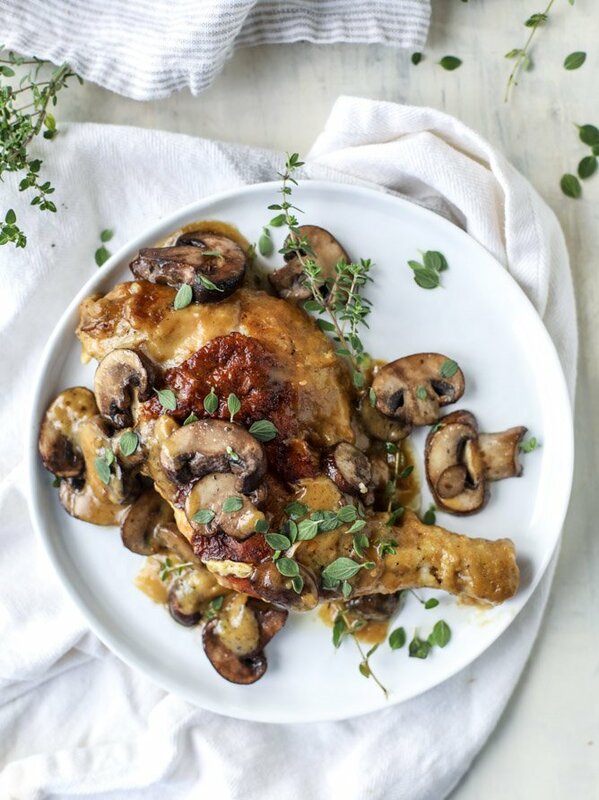 Also kind of reminds me of this old school recipe I shared yearssss ago for caramelized chicken with mushrooms that is still a huge favorite of ours too. And yours! I always get emails and messages about that recipe even years later, so this one here is a must-try then. But for now, I must scream from the rooftops about how you should make THIS one. And maybe make it with mashed potatoes too. I mean, just sayin’. Note: for this recipe, you want something super heavy, like a brick or a small baking dish filled with weights. I actually use a 6×6 inch baking dish or a plate and place two 8-pound weights inside of/on it! Take the chicken and spatchcock it – meaning you want to cut out the backbone and flatten it. It’s intimidating at first, but once you do it, it’s get easy! Here is a photo tutorial on it. Season the chicken with salt and pepper. Heat a large cast iron skillet over medium heat. Add the butter and once it’s melted, place the chicken skin-side down in the skillet, tucking the wings underneath. Place the plate or dish on top and put your weight (brights/weights/cans/etc) on top of it. Cook for 25 to 30 minutes, until the skin is crispy and golden brown. Remove the weights and place and carefully flip the chicken over so it’s skin-side up. Replace the plate and weights and cook for 15 to 20 minutes more. After 20 minutes, transfer the chicken to a plate. It’s okay if it starts to fall apart here! I like to leave all of the fat in the skillet unless there is a ridiculous amount (I like up to about 1/4 cup in the skillet). Whisk in the minced garlic and the flour to create a roux – you want the mixture to be golden in color and smell fragrant. Very slowly whisk in the stock, whisking the entire time until the mixture thickens. Once it’s thicken, add the chicken back to the skillet, skin-side up. Cover with the plate and weights again and cook for 20 to 30 minutes. To serve, pull the chicken apart (it should fall apart on its own!) and place it on a plate. Cover it with some of the gravy and the thyme butter mushrooms. We adore this just as chicken and mushrooms, but it’s to die for with potatoes (roasted or mashed) and rice too! Heat a large skillet over medium-low heat and add the butter and olive oil. Add in the mushrooms, stirring to coat, and cook until they are soft and juicy, stirring often, about 6 to 8 minutes. Stir in the thyme. Sprinkle with salt and pepper. Turn off the heat. And forgive it for its lack of beauty. I think this meal looks delicious! Fall is the season of brown food anyway. Lol. thanks love!! wish it was 55 here! It’s not ugly, I love mushrooms and a chicken gravy and you need lot’s of fresh dinner rolls to sop it up. thanks so much alicia! so hot and humid here too! I honestly do not know what you are talking about because I think this looks so freaking delicious. The comfort food vibes are SO strong. I am putting this on our menu for next week and I cannot wait! thanks ashlyn! it is REALLY good! You, your belly, and Max look SO great on The Kitchn…and standing in your brand new kitchen! Love it!! Sorry, SO off topic but I just couldn’t help myself. Brown meat and gravy screeeeeeeeams cold weather comfort food! And honestly, I think she is a BEAUTY! Definitely wouldn’t take much convincing. I bet Eric would love this. Marking this one down for when I need to impress dinner guests. I want to drink the gravy and I can only SEE the dish! Really, though, this looks spectacular. Alas, even though I am the cook, my significant other hates mushrooms (crazy lady) and is a vegetarian. This has a double whammy in our house, but I might make it anyways. teehee. Do you think this would turn out OK using chicken breasts? That’s what is in the freezer and I don’t have time today to get a whole chicken. it would really be a completely different recipe using chicken breasts. there would be no need to press them under the weight, you wouldn’t have the crispy skin or bones in for juicy/tenderness – i’m not sure how to even really convert it for chicken breast, unfortunately. so sorry! it’s 2 TBSP. just fixed it. OH MY GOD!!! I’m salivating. This is awesome dear. Please, can i repost while giving credit to you? What kind of cookware would you use if you don’t have cast iron? you probably want to use something oven-safe – but cast iron really is best – a nonstick skillet just won’t get hot enough. i think i just experienced slight heart failure; clicking on your blog from my bookmarks bar (you’re first! ), seeing the new design gave me a minute of pause. so glad to see it’s still you. OH LAWD. Get this, I was literally thinking to myself yesterday, “I wonder if Jess is ever gonna do a site redesign.” And look at that – Purr & Co. read my mind! ;D I LOVE the new look – it’s simple yet somehow just shouts with your bubbly personality all at once. Getting ready to make this and reread the ingredient list and the recipe. 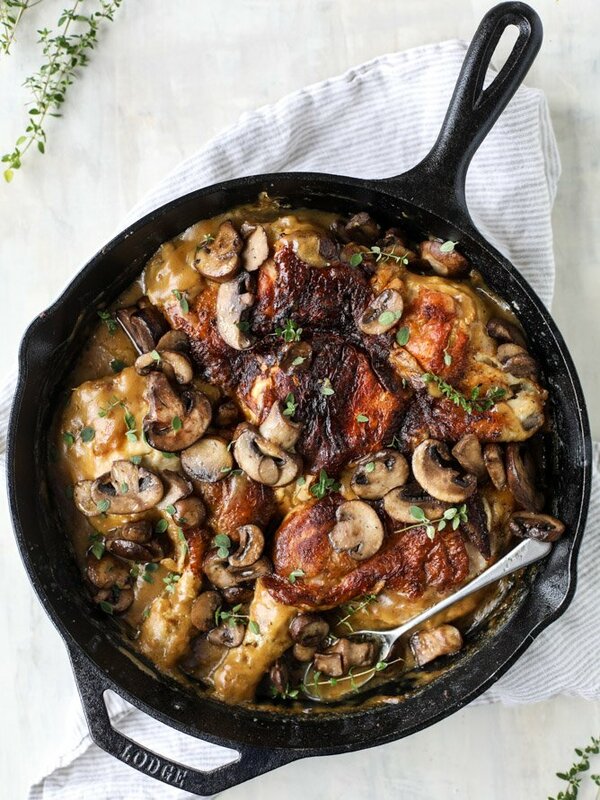 The recipe says to add the butter to the skillet for cooking the chicken, but there isn’t any butter listed in that section, just for the mushrooms. Going to go ahead and, based on the amount of flour used to make the roux, make it using 2 tbs. butter for the chicken and see how it turns out. so sorry! it is 2 TBSP. :) I fixed it! Enjoy! Just made this for lunch. DELICIOUS! WONDERFUL! FANTASTIC! woohoo! so glad it was a hit! so glad you liked it! isn’t that skin amazing? love it so much! I’m sorry if I’m just missing it entirely, but do you cook this on the stove or in the oven, and what temp? This oddly seems to be missing entirely. hi dani! you cook this on the stovetop. it is not missing entirely – the cooking directions begin in the third paragraph down under the DIRECTIONS: headline in the recipe box with the sentence “Heat a large cast iron skillet over medium heat.” let me know if that helps! In the 7+ years I’ve been following your blog and making recipes from here and your cookbook (patiently waiting for The Pretty Dish, is it March 2018 yet?!?!) I had my first howsweeteats recipe fail with this :( I’m so bummed! I think I browned the chicken a little too much because the gravy was dark dark dark dark brown and the only flavor was a deep, intense, horrible burnt bitterness. Not that delicious charred flavor or anything, just straight up burned beyond repair bitterness. Bleh. I made it a few weeks ago and even thinking about it now I’m feeling nauseous just thinking about how bitter it was. I could barely stomach it and ate what I could force down because I was hungry! I need to try this recipe again but I’ll go easy on the browning of the chicken next time. On another note, I’ve already made 3 batches of your salted dark chocolate chunk cookies soooo thanks again for yet another winner! Fabulous! Added some quartered red potatoes and sliced jalapenos to the skillet under the chicken. Delicious chicken and crispy potatoes. This is on my favorites list now. Made this last night for dinner. Husband was well please. It turned out to be outstanding. Cutting out that backbone wasn’t bad at all. Keep the recipes coming. I love it! Thanks! Soooo, this looks amazing! Question, though, my boyfriend keeps kosher. Any suggestions for a way to substitute the butter for something non-dairy? Can you tell me what size cast iron skillet you use?? Delicious recipe. My family loved it – especially the gravy! I saw you making this on Instagram a few weeks back with the rosemary smashed potatoes. I had to put it on my meal plan list. I hate to say it, but it was a complete disaster except for the potatoes. I followed the directions exactly and after 25 minutes on the first side, I flipped my chicken to discover it was completely burned. My kitchen smelled awful for hours and there was grease splatter everywhere. I just threw it out as I didn’t know how to salvage without further burning and bad smells. Ugh. Felt like I wasted an hour and entire chicken. The potatoes were delicious so we ate those with leftover pizza. I probably won’t attempt this again just because it took a lot to deal with the whole raw chicken. Will see if I can find something like this using chicken breasts or drumsticks as the concept with the gravy sounds so good.